Have you heard of the Harry Potter’s Chicken and Mushroom Pie, or even tried it before? 8 tbsp. chilled margarine, cut into cubes. 8 tbsp. Holsum ( shortening). Roughly ¼ cup cold water. Place the cake flour, margarine and, Holsum into your food processor and pulse until it resembles crumbs. Add the water and using your hands, bring the mixture together. Knead until nice and smooth, if there are lumps of margarine or shortening it is okay as long as they are small lumps. Cling wrap and pop into the fridge to chill for 2 hours. 800 g chicken fillet, cubed. 1 egg, whisked with 1 tsp tap water, for brushing the top of the pastry. Add the onions and mushrooms, saute until the onions are transparent. Add the cake flour and give it a good mix. Allow to mixture to cook till it starts to thicken. Add the chicken, thyme, and seasoning. Allow the mixture to come to the boil again, then remove from the heat and set aside to allow to cool till it reaches room temperature. How to assemble the pie. Take one parcel of the pastry out and roll it out ono a floured surface. Spray your pie dish with cook and spray and then carefully place the pastry into the bottom of your pie dish. Spoon the filling into your pie dish. Roll out the second parcel of pastry and place it over the top of the filling. Make sure to seal the edges of the pastry and the create a steam vent in the top of the pastry. Pop into a preheated oven and bake at 180 degrees for 20 minutes or until the top of the pie is golden brown. 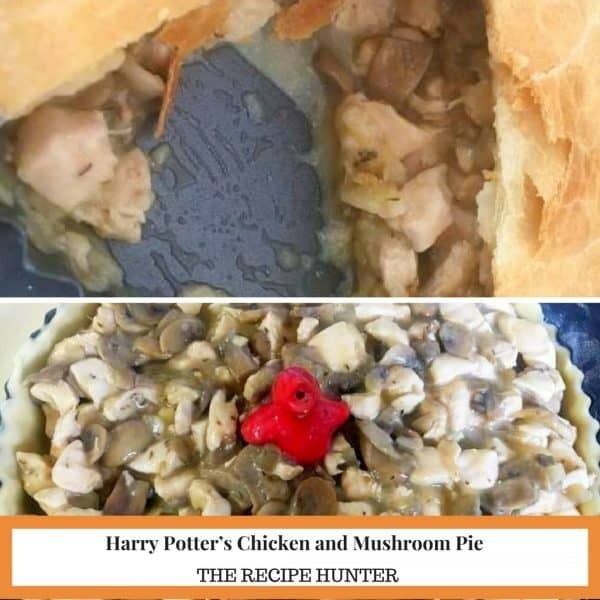 So, I’m curious about why it is “Harry Potter’s” chicken and mushroom pie? But, it sounds delicious! I will ask the lady that made and submitted this recipe and revert back to you once I hear back from her. Thanks for popping over and hope you will try it and enjoy it Lise. Sounds delicious, but why Harry Potter? As far as I remember, it was a cake that smacked his aunt, not a pie. I’ll need to do some research on it among Potterheads. Meanwhile, it’s good to hear from you, dear Esme! Please keep me posted funky cat – I did try to make contact with the original poster but have not heard back as yet regarding the name. Hope you will have time to test it out and enjoy it.